06 March 2019 Fix: Failed to activate the free Halo visualizer version in some cases. 31 October 2018 New: Minor improvements. Fix: Spectrum height adjustment in Halo v1.20 failed to work. 01 November 2017 New: Simple Audio Spectrum visualizer compatibility added. New: New SoundVisible templates notification added. New: Frame rate setup added. New: Load audio track from video files. Fix: Some minor bugs were fixed. 20 March 2017 Tweak: Check if imported audio/image files still exist on starting setup and update GUI if needed. Fix: No audio setup started, if opened a new project file and imported the same audio file. Fix: No spectrum height adjustment started if opened a new project file and imported the same audio file. 14 March 2017 New: Audio React Tunnel Music Visualizer compatibility added. Fix: No need to restart the script after opening a project file. Fix: Output module templates load and assign automatically. 06 December 2016 New: After Effects CC 2017 compatibility added. 27 November 2016 Fix: Multi language support improved. 09 November 2016 New: Halo Music Visualizer compatibility added. 12 October 2016 Initial release. The Auto-Setup Script works with SoundVisible templates only. No need to download it if you have no SoundVisible audio react template. This is a script for Adobe After Effects. We created this tool to help our customers to set up SoundVisible music visualizer templates without wasting their precious time. This script does all the tedious work on a project preparation for rendering. Essentially, all you have to do is to import your music file, type in your texts (music track name, artist name, etc. ), select the images you want to use as a background or logo, then press the Apply button. There you go! You are ready to render a music video in full HD 1080p or 720p. Using this script, you can make an initial setup of a SoundVisible template within a minute or so. After the initial auto-setup is completed, the template is ready for rendering. Of course, you may adjust the visualizer appearance and animation settings before starting the render if needed. 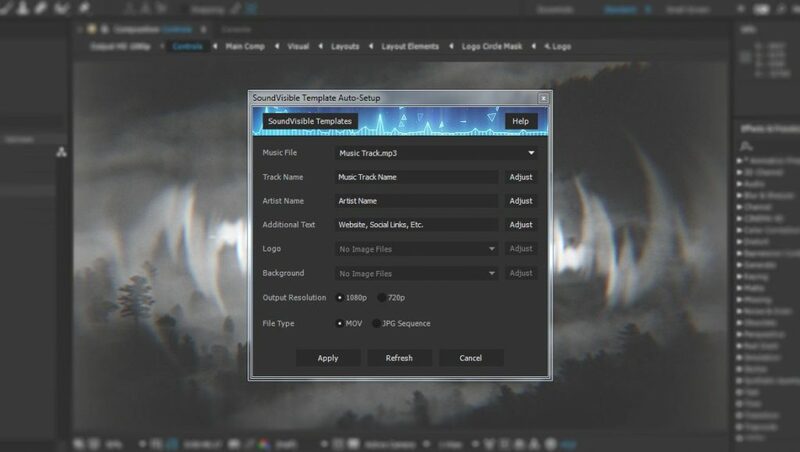 All the SoundVisible visualizer templates come with this script. Also, you can get the latest version of this script for free at any time.